Jim Joseph was born and raised in The Bronx, NY and currently is the Theatre Manager at the Samuel J. Friedman Theatre, the Broadway home of Manhattan Theatre Club. 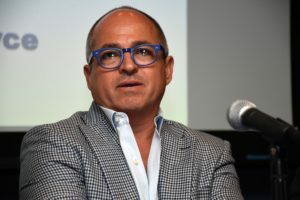 Since graduating from Marist College in 1991, he has worked in many different areas of the performing arts and Broadway including Development, Education, Marketing, Box Office and most notably Front of House and Theater Operations. In December 1995, he was a part of the inaugural staff at The New Victory Theater, the city’s first theater dedicated to kids and family programming, helping to launch The New Victory Usher Corps – a groundbreaking, youth development program for NYC youth. From 1995 until 2008, Jim hired over 400 teens and young adults, giving most of them their very first job and helping some of them launch careers in the professional theater as artists and administrators. Jim has worked in the off-off Broadway community as a director and producer, working with the ground-breaking Latino Theatre Company, Vaso de Leche Productions, and the actress/poet/activist La Bruja on her one woman show Boogie Rican Boulevard among others. As an arts administration consultant, Jim has worked with The United Palace for Cultural Arts in Washington Heights, The Kupferberg Center for the Arts at Queens College, 59E59 Theatres and The Apollo Theater. 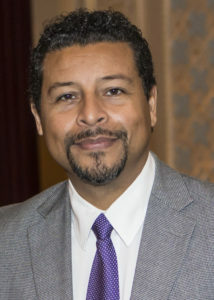 In addition to his theater operations consulting work, he has been an advisor to the theater program at Borough of Manhattan Community College since 2010 and has served as an adjunct instructor of theater management. He is a graduate of the Arts Leadership Institute (2010) and the Commercial Theater Institute (2014). He is a member of the Venue Committee of the Broadway Green Alliance, the Broadway Security Steering Committee and the Broadway League’s Diversity & Inclusion Committee. Please describe your current position and company. I’m the Theatre Manager for Manhattan Theatre Club’s Broadway home – The Samuel J. Friedman Theater. I was offered an opportunity early in my arts management career to house manage an off-Broadway production and I discovered very quickly that I had the skill set to do the job. What are some of the challenges of your job? What are some things you find the most rewarding? Every day I have 650 variables to my workday. Every audience member presents a unique set of challenges and demands, making no two performances alike. It’s the ability to adapt to many different variables but still deliver consistent service that makes the job a challenge. How has the Broadway landscape changed over the past decade or so? With the success of WICKED and the Disney musicals, we are seeing less original ideas on stage. Most works are adaptations of well-known properties and their success is dependent on the audience’s knowledge of the source material. Movie studios see the potential profits of a successful musical and are becoming more and more involved on Broadway. What steps is the Broadway industry taking towards inclusion and a more diverse workforce? How effective do you think these efforts have been? I don’t think there have been too many steps taken, sadly. Broadway producers don’t think of the Broadway industry holistically enough to even think about answering this question. They are concerned about their show and selling enough tickets to pay back their investors so that they can invest in the next project. There have been efforts made to increase diversity by the non-profits in their administrative offices and some shows have had success using “color conscious” casting. Producers need to work harder on developing new creators and new properties. Invest in creators of color. Find the next Lin-Manuel, the next John Leguizamo, and don’t forget about the talented writers of color who have been under-represented on Broadway – the Lynne Nottages and Nilo Cruzs of the world. How can we attract more young people from all walks of life to the theater? Create work where they can see themselves represented. It all starts with the art that’s being produced. We’re in the fascinating and short time between Tony nominations and the awards themselves as I write this. It’s a period when there are interesting things to learn about how shows are looking at their nominations. You’ll only be able to get a personal view, since you won’t be in on the overall strategy each show is using but if you’re sensitive to what you’re seeing, you can learn something. Producers and their marketing teams spend a lot of time talking about who their main audience is and how to reach them. Are they dedicated theater-goers who look at the New York Times or theater websites? Are they predominantly TV watchers? Are they tourists who are looking for a show to see and spending time in Times Square? Are they millennials who are focused on social media on their phones? These producers have suddenly been presented with a new “asset” – Tony nominations – and armed with that news, they are making choices within (and often exceeding) their budgets about how to reach their specific audience. So, pay attention to how much of that information you’re getting and where you’re getting it from, and you might begin to get a glimmering of a show’s overall strategy. Are you seeing paid advertising or social posts on Facebook? Dominating ads in the Sunday New York Times or in a strip banner across the Arts page? On a billboard or a trash can in Times Square? On TV? There’s only this short time for producers to make the most of this opportunity because once the awards have been given the value of nominations quickly fades. Producers are trying to make the most of it, and so should you. This week we pull back the curtain on a man who has spent his career wearing a multitude of hats throughout his decades in show business. 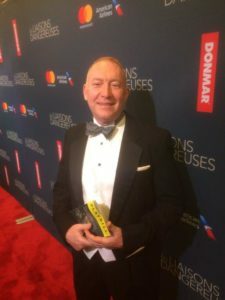 We sat down with The Nederlander Organization’s Director of Theatre Management, Thom Clay! Learn about how Thom’s early days as a company manager and stage manager led him to travel across the country, work with stars such as Daniel Radcliffe, Kathleen Marshall, and Matthew Broderick, and even manage a concert in the East Room of the White House. What is your current job and what does it entail? What do you enjoy most and least about your job? Tom Clay: My current position is Director of Theatre Management. I work with a team in the Operations Department of the company and we are responsible for the operation and management of nine Broadway theatres. Part of my duties include working with the managers in each theatre to ensure that all of their weekly financial paperwork is in order. Each week we “settle” the box office receipts and expenses with each production so there is a large amount of detailed documentation required. Every theatre employee is paid weekly so in addition to accurate paychecks, union benefit reports must also be prepared and submitted. Other responsibilities that are under my supervision are the preparation of emergency plans for each of the theatres, staff training in safety and customer service, and the review of employee performance. I also work closely with the production in each venue, especially when new productions are about to begin performances. The “taking in” of production involves a large number of people to execute it and it often happens in a fixed time frame so there is little room for error. One final area that I am involved with is small renovation and restoration projects. Several of our theatres are between 80 and 100 years old, so they require constant maintenance and upgrading. Today’s audiences have high expectations when attending a Broadway show, so we work to provide a magical experience from the moment they arrive at one of our theatres. There are many things I enjoy about my position, but the thing I think I enjoy the most is being able to work in a creative and constantly changing environment. While Broadway is a business, the people that make theatre are wonderful, interesting individuals who I get to see make magic every day. With so many varied productions in our theatres, I am fortunate to be part of an always evolving experience. As for what I enjoy least, I don’t think there is any part of the job that isn’t enjoyable in one way or another. Everyone here has one goal and that is to put on the best possible Broadway experience for our patrons and producers. Can you describe what the Nederlander Organization does? TC: The Nederlander Organization is one of the largest family-owned entertainment enterprises in the world. While the primary focus is on owning and operating nine Broadway theatres, the company also owns and operates venues in other cities in the U.S. and U.K. Additionally, the company is leading producer of many of Broadway’s hit shows. Are there any interesting goals or projects with which you are currently involved? TC: As the spring is a busy time across all of Broadway with many new shows opening, there is one project that I am involved with that is unique and exciting. Later this year the 108-year-old Palace Theatre will be restored as part of a massive development project happening on the corner of Broadway and West 47thStreet. In partnership with real estate developers, the theatre will be restored to its former glory along with the addition of new dressing rooms, lobbies and stage equipment. As part of the construction project, the theatre will be raised 35 feet from its current position and a new entrance created on West 47thStreet. A new hotel will be constructed on top of the theatre and retail space created below. The entire project is estimated to take three years. Can you describe your career path and what led you to this job? TC: The start of my career was like many, I believe. I was attracted to the magic of the theatre in middle school and thought about a career as an actor. I was in the plays and musicals while in high school and then pursued a college degree in theatre. While in college I began to see that the life of an actor could be difficult and challenging so I began to question if that was something I was ready to commit to. Through taking a variety of theatre courses, from directing to design, I realized that I could still work in the theatre without being an actor. I began to stage manage for the school productions and found it to be even more fulfilling that any of the acting roles I had. After completing my undergraduate degree, I was fortunate to be offered a stage management position at the local children’s theatre. I would also work in the summer as a stage manager for local musicals which were both great opportunities to learn about the craft of theatre outside of an educational setting. After working as stage manager for about five years, I became interested in opportunities beyond stage management and was attracted to the work that producers were doing. I wanted to be heading in that direction and decided to get an advanced degree in theatre management to grow my skill set. I received my Master’s Degree from Columbia University in 1996 and began working in the management offices of the Really Useful Company. After 3 amazing years working in that office I took a job as the assistant company manager on the national tour of Riverdance. I remained with them for 3 years and for the next two decades worked as Broadway company manager as well as a tour manager for Radio City Music Hall. After a fulfilling career as a Broadway company manager, I began to look for the next theatre opportunity. Having worked in many Nederlander Theaters I was well aware of the company and its importance to the theatre in this country. I was in contact with several colleagues within the organization and when my current position became available I accepted immediately. It’s been great to continue to use my skill sets and contribute to this wonderful organization. Previously, you were a company manager and a stage manager — can you describe what each of these do? What are some of the things you liked about each of these lines of work? TC: Both the stage manager and company manager fill two important roles on a production and work very closely together. The stage manager is responsible for the actual running of the performance. In rehearsals, they work closely with the director to rehearse the production and gather all of the information that will be needed to execute a performance. During performances, the stage manager ensures the actors, crew and staff report on time and maintain their performances as directed. While the show is running, the stage manager directs the crew and scenic elements through the calling of “cues.” Basically, the stage manager is in charge of the backstage area and to make sure the performance happens as planned from beginning to end. The company manager’s job differs in that they do not work backstage in the same function as the stage manager but functions as representative of the producer. The company manager usually oversees the day-to-day business operation of the production from generating the payroll and paying bills to assisting with ticketing and marketing initiatives. 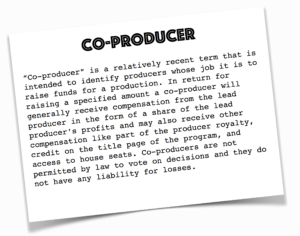 Company managers often create contracts for the cast, crew and creative team, and assist in executing the contract terms. As there are over a dozen unions on Broadway, the company manager must understand each one’s rules and carry them out accordingly. The company manager works closely with the theatre’s box office to record ticket sales and box office revenue. These are just some of the major areas the company manager is responsible for and those duties can change depending on the needs of the production. As you can see from the above, both positions have different responsibilities but each manager works closely to keep all areas of the production running smoothly. As a stage manager, I always enjoyed the rehearsal process to see how the show gets created before an audience sees it. As a company manager, I really enjoyed seeing all of the elements from the “big picture” perspective and how they all come together to create a show. What have been some of your most memorable work experiences? TC: This is a hard one! I have been so fortunate to work on some amazing productions and alongside some remarkably talented individuals. I have enjoyed working with great directors like Michael Grandage and Kathleen Marshall as well as talented actors Matthew Broderick, Daniel Radcliffe and Janet McTeer. Because it was unique in so many ways: I was asked to company manage a concert of Broadway music held at the White House in 2010. As part of a series on Public Television, I assisted in organizing some of Broadway’s top talent to perform for The President and Mrs. Obama in the East Room. That one is hard to top. What kind of training/degrees do you have and which of these would you recommend for a young person wanting to enter this business? TC: I have both a Bachelor of Fine Arts in Theatre and a Master’s Degree in Theatre Management. I think each person has a different path to a theatre career, so a university degree may not be for everyone. I wanted the university training structure which also led to connections within the commercial theatre, but many of my colleagues have degrees in other fields. The one thing I can recommend for someone looking for a career in this business is experience. That is often more important than a degree. Learning how theatre works, what the various roles – on and off stage – are, and who the current players in the business are are all key to success. Immerse yourself in theatre. Observe and learn from others. See as much as you can and read about theatre in New York and around the world. Working as an intern or volunteering as an usher can be very beneficial to experiencing how theatre professionals work day in and day out. This will prove to be an invaluable asset. What kind of advice would you give to someone wanting to enter the commercial theatre business? 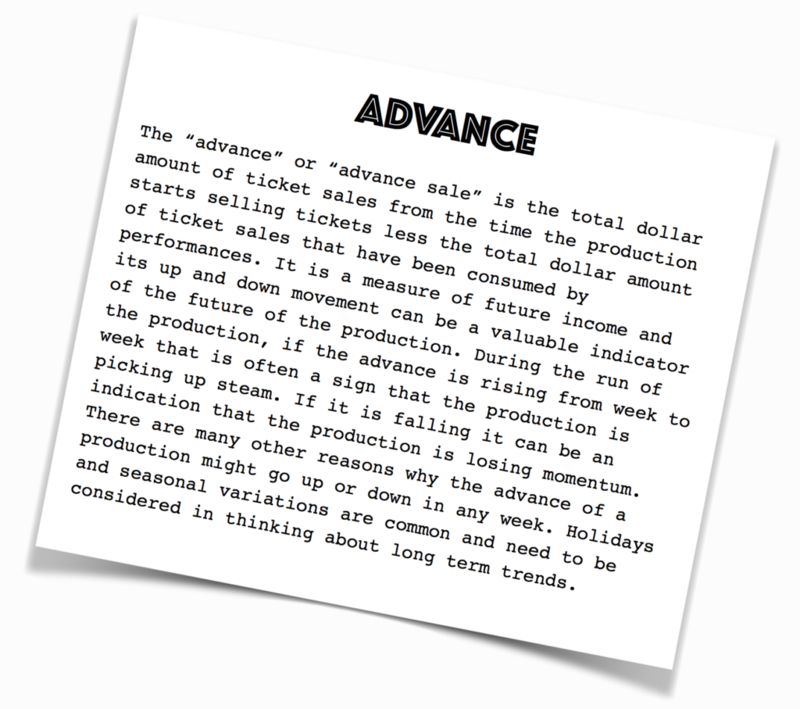 TC: To echo the above, learn as much as you can about all aspects of the business. Understand how directors and designers work and interact. Know how advertising and marketing agencies operate and sell shows in the digital market place. Learn about budgeting and unions as in the end, everything comes down to money. Read about the latest playwrights as they are the ones providing the new productions on the horizon. Hone a critical eye and form your own opinion about what makes good theatre. Love the art and artists, but always remember that at the end of the day, it’s a business. We talked with Flody Suarez, who is currently bringing The Cher Show to broadway. We wanted to hear about his extensive work in the entertainment industry across TV, film, and the stage as well as the particulars of bringing iconic songs into a whole new setting. How were you first introduced to producing? Flody Suarez: I was the V.P. of Advertising for a small film company releasing art house films, and through that experience I got to work with a lot of young, scrappy producers making passion projects. It was an interesting learning experience and it taught me a lot about the budgeting and marketing process. From there, I went into TV at NBC and was able to learn from some pretty amazing executives and producers. Warren Littlefield was the President of NBC and he is a role model in nurturing and supporting producers. I was lucky enough to work on projects with Marcy Carsey, who set the bar for helping comedy writers and comedians navigate the network process to get their vision on air, and John Wells, who is fearless and brilliant at pushing a drama to be intelligent and provocative in a way that engages audiences. I am kind of a sponge and like to watch and study what makes other people successful. I was lucky to have a front row seat to some really special people. You’ve had plenty of experience with both theatrical producing and producing for TV and film. Can you speak about some of the major differences and similarities between them? FS: I have a lot of television experience, having worked in comedy, drama, long form, and reality programming, but Broadway is something new to me. The drive for me to try theater was mainly project specific. I had these two ideas that really could only live on stage, so I moved to NY and started to try to learn about this process, which is similar to TV in that it is ultimately about finding great writers and nurturing their process. It is also wildly different from TV in the way shows are built, both creatively and structurally. I was lucky enough to meet Rick Elice, who is writing the The Cher Show and Joe Dipietro, who is writing What’s New Pussycat, The Tom Jones Musical – they are both brilliant and I have loved watching them shape these very different shows. The process is much slower than television and it is a much more intimate process in that there are no studio or network notes. The process is really between producers and their creative team. You have an impressive partnership with Jeffrey Seller. How was this partnership formed? What was the process of creating Seller Suarez Productions? FS: When I came to New York it was with the intention of finding a producer to bring aboard The Cher Show to help me navigate this world. I met with a lot of people and was really stunned at what a small and interconnected business this is. People are passionate and professional and really opened their doors to me – this is a special community and I have been blown away by how kind people have been. I was lucky enough to attend a workshop of Hamilton and was a little stunned at the confident way it was presented. Every aspect of it seemed to have been meticulously planned. I spent a great deal of time watching Jeffrey while watching the show. Like Marcy Carsey, John Wells, and Warren Littlefield, Jeffrey is someone at the top of his game that I can watch and learn from. We started to do a little TV as well, so there is a nice flow of knowledge between us. We have Rise, a new drama from Jason Katims, airing on NBC this March. It is a book Jeffrey loved about a high school drama teacher and really feels right as our first TV show. Congratulations on your new project, The Cher Show. What has it been like developing a bio-musical about such an iconic artist? FS: The Cher Show is something that has been in my head for over a decade and I finally had to just pack up and move to New York to dive into the process. Cher has had an incredible career and her music has spoken to audiences for over five decades. It is a powerful story about believing in yourself and never letting someone else define your success – her iconic status creates a ton of opportunities to tap into sounds, images and moments that have a personal connection to the audience. You have had enormous success in your producing career. Do you have any advice to young professionals who are just getting started? FS: Every job is a learning experience. Watch everyone around you. See what they do that works and what they do that doesn’t work. Realize that they all have hopes and dreams and are doing a job. They are trying to get ahead just like you. Make friends, help people along the way. It is a small business and those people will be in your life for a long time. Be nice and be honest. It will pay off. Pursue things you are passionate about and surround yourself with people you respect. Know that failure is part of the process. Keep moving forward. Don’t let anyone discourage you. If you believe in something find another way. You will get one hundred “no”s for every “yes”. Welcome to the start of a CTI blog. If you’re here on the CTI website, I’m guessing Broadway is a passion for you and you’re interested in learning more about how the business of Broadway works from the inside. It’s a business that is both thrilling and frustrating, a life-changing experience and enough to drive you crazy. 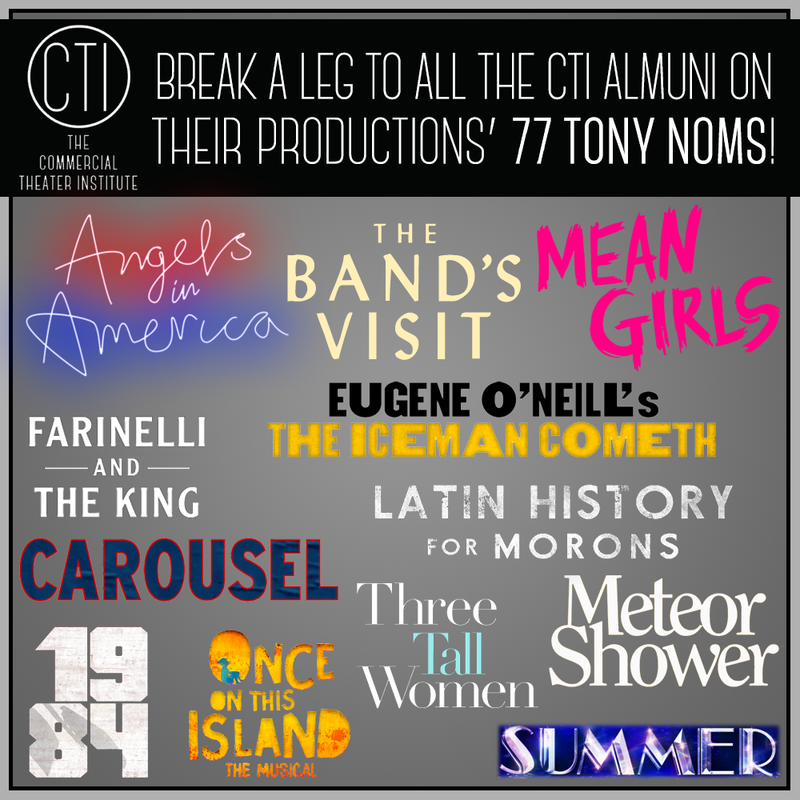 Over the past 37 years at CTI we teach the teachable part of Broadway producing. Using what they’ve learned here, dozens of CTI alums have gone on to produce some of Broadway’s great hits. Our courses are all taught by working Broadway professionals – from producers and general managers to ad agency executives and attorneys. Our networking opportunities will help connect you to these pros and to others who are like you – excited to learn more about the business of Broadway. This blog will be a kind of supplement to the CTI courses that you can enjoy whether or not you take the courses themselves. We’ll be talking about best practices, the difficult issues that arise when you produce a show, emerging trends, and how-to resources. I’ll write some of them, we’ll do some interviews with important players, and go into some nuts-and-bolts ideas too. 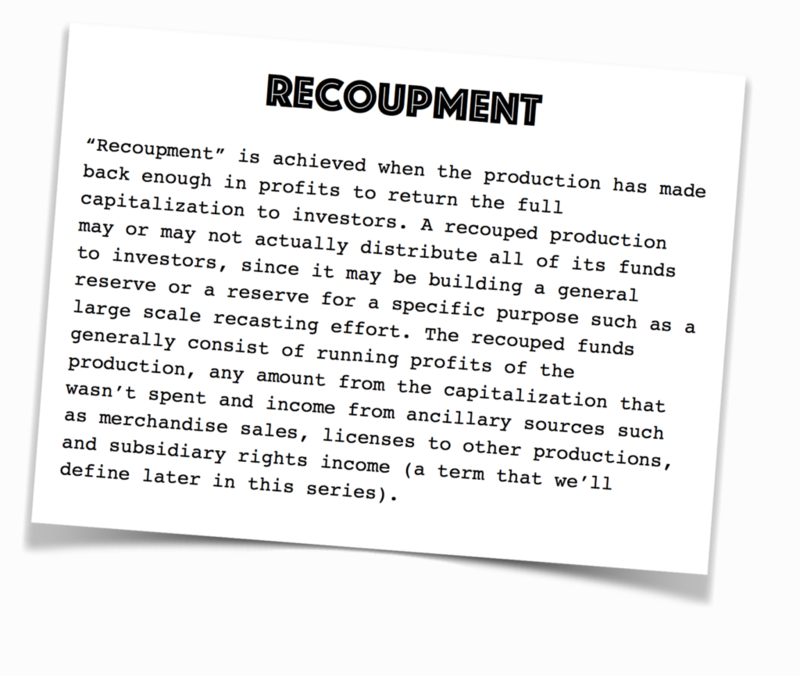 Along the way, we’ll define some terms to give you the working vocabulary you need. I hope you’ll join us both here and in person at CTI’s courses. You couldn’t pick a more exciting field. 2017 Robert Whitehead Award Winner Announced! New York, NY – January 12, 2017 – Tony Award®-winning Broadway producer Mike Isaacson will be presented The Commercial Theater Institute’s Robert Whitehead Award for “outstanding achievement in commercial theatre producing” at a reception at Sardi’s on Tuesday, March 14, 2017. The award is inspired by the five-decade-long career of Tony Award-winning Broadway producer Robert Whitehead, who died in 2002. CTI is the nation’s only formal program that professionally trains commercial theatre producers. The award honors a graduate of CTI for outstanding achievement in commercial theatre producing. CTI presented the first Robert Whitehead Award in 1993 to Benjamin Mordecai and Susan Quint Gallin. “What I love about Mike is that he’s very brave in his producing decisions but deeply concerned about the people who he works with and the people who work for him. As both a presenter and producer he’s created organizations filled with professionals who love what they do and love him for leading them. He’s just what every producer should aspire to,” said Tom Viertel, Executive Director of CTI. Since 2000, Mike Isaacson co-headed Fox Theatricals with Kristin Caskey and has produced more than 21 Broadway musicals and plays, national tours, off-Broadway plays, and London productions. In June of 2015, he received the Tony® Award for Best Musical for Fun Home by Lisa Kron and Jeanine Tesori based on the graphic novel by Alison Bechdel. Fun Home won five 2015 Tony® Awards and was also a finalist for the 2014 Pulitzer Prize for Drama. It also received The Obie, The New York Drama Critics Award and The Outer Critics Circle Award for Best Musical. A national tour opened at Cleveland’s Playhouse Square in October of this year and will tour the U.S. throughout 2017. Other producing highlights include The Humans (2016 Tony Award, Best Play); Bring It On The Musical (2013 Tony® nomination for Best Musical); Red(2010 Tony® Award, Best Play); Legally Blonde the Musical (2011 Olivier Award, Best Musical); Thoroughly Modern Millie (2002 Tony® Award, Best Musical); You’re a Good Man, Charlie Brown; If/Then by Tom Kitt and Brian Yorkey and starring Idina Menzel; The Seagull starring Kristin Scott Thomas; Caroline, or Change by Tony Kushner and Jeanine Tesori; One Flew Over the Cuckoo’s Nest starring Gary Sinise, and Death of a Salesman (1999 Tony® Award); Traces (Off-Broadway and national tour); Grace, starring Paul Rudd and Michael Shannon. For the Independent Presenters Network, he served as producer for the Broadway productions of Spamalot (2005 Tony® Award, Best Musical), Ragtime (revival) and The Color Purple. With his IPN colleagues Tom Gabbard and John Breckenridge, he also produced and supervised the revised national tour of 9 to 5 The Musical, which played throughout the U.S. and the U.K. All told, his productions have received more than 96 Tony® Award Nominations, and 29 Tony® Awards. 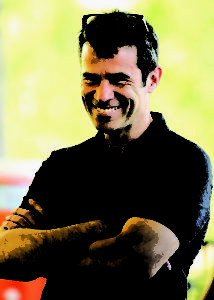 Mike Isaacson is also the third Executive Producer in The Muny’s 99 year history. He has produced 35 shows there, and The Muny will celebrate 100 years in its 2018 season. For 14 years, Isaacson supervised the U.S. Bank Broadway Series, bringing more than 100 Broadway productions to St. Louis’s Fabulous Fox theatre. In 2010, he received the Broadway League’s Samuel J. L’Hommedieu Award for Outstanding Achievement in Presenter Management. Isaacson has also served on the Board of Governors, the Executive Committee and the Governance Committee of The Broadway League. He was most recently honored for “Excellence in the Arts” by the Arts and Education Council in St Louis. A joint project of The Broadway League and Theatre Development Fund, CTI was founded in 1981 by the late Frederic B. Vogel. The current executive director, Tom Viertel took on leadership of the program in 2013. The Commercial Theater Institute presented the first Robert Whitehead Award in 1993 to Benjamin Mordecai (seven August Wilson plays on Broadway) and Susan Quint Gallin (Who’s Afraid of Virginia Woolf?, Monty Python’s Spamalot). Subsequent honorees include: Dennis Grimaldi (The Heidi Chronicles, On The Town) in 1994; Kevin McCollum (Something Rotten, In the Heights) in 1995; Randall L. Wreghitt (The Miracle Worker, Grey Gardens) in 1996; Marc Routh (Penn & Teller on Broadway, A Little Night Music) in 1997; Liz Oliver (Wait Until Dark, Last Night of Ballyhoo) in 1998; Eric Krebs (The Dinner Party, Electra) in 1999; Anne Strickland Squadron (Bill Maher: Victory Begins at Home, The Herbal Bed) in 2000; David Binder (Hedwig and the Angry Inch, Of Mice and Men) in 2004; Nick Scandalios (Executive VP of the Nederlander Organization: Wicked, In the Heights) in 2008; Dori Berinstein (Legally Blonde: The Musical, Thoroughly Modern Millie) in 2009; Stuart Thompson (King Charles III, The Curious Incident of the Dog in the Night-Time) in 2010; Jill Furman (Hamilton, Rodgers and Hammerstein’s Cinderella) in 2011; Jon B. Platt (Fish in the Dark, The Audience) in 2012; Jeffrey Finn (An Act of God, Elephant Man) in 2013; and Robert Cole (Ma Rainey’s Black Bottom, Angels in America, Once) in 2015; and Stacey Mindich (Dear Evan Hansen, Hedwig and the Angry Inch, The Bridges of Madison County, Lucky Guy) in 2016.